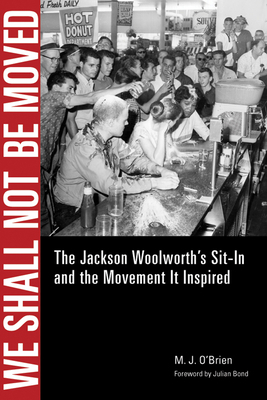 We are pleased to announce that Teaching for Change board member Michael J. O’Brien’s book, We Shall Not Be Moved: The Jackson Woolworth Sit-In and the Movement it Inspired, is one of the 2014 Lillian Smith Book Award recipients. The Lillian Smith Book Awards were established in 1968 by the Southern Regional Council to recognize authors whose books represent outstanding achievements demonstrating through literary merit and moral vision an honest representation of the South, its people, its problems, and its promise. The 2014 awards will be presented on August 31, 2014. Once in a great while, an image captures the essence of an era. Three people–one black, two white–sit at a lunch counter while a horde of cigarette smoking hot shots pour catsup, sugar, and other counter condiments on the sitters’ heads and down their backs. The image strikes a chord for all who lived through those turbulent times of a changing America. And for those too young to have endured that period, it evokes an era, not that long ago, when the ordinary act of getting a cup of coffee with a friend of another race could spark a riot. Lillian Smith was one of the first prominent white southerners to denounce racial segregation openly and to work actively against the entrenched and often brutally enforced world of Jim Crow. From as early as the 1930s, she argued that Jim Crow was evil (“Segregation is spiritual lynching,” she said) and that it leads to social and moral retardation.